(RNS) — When Andrew Hamblin walks into church to preach on a Sunday morning, he brings along death in a box. 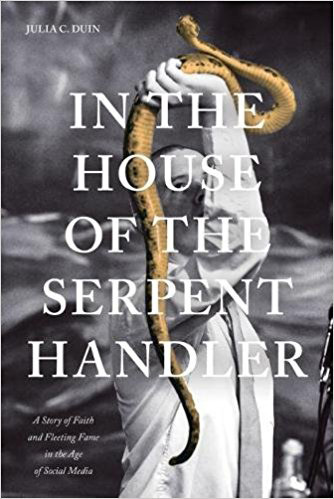 Snake handling traces its roots to the Pentecostal fervor that swept the U.S. in the early 20th century. Pentecostals believe in “signs and wonders” — that speaking in tongues, prophesizing and faith healing are spiritual gifts endowed by the Holy Spirit. 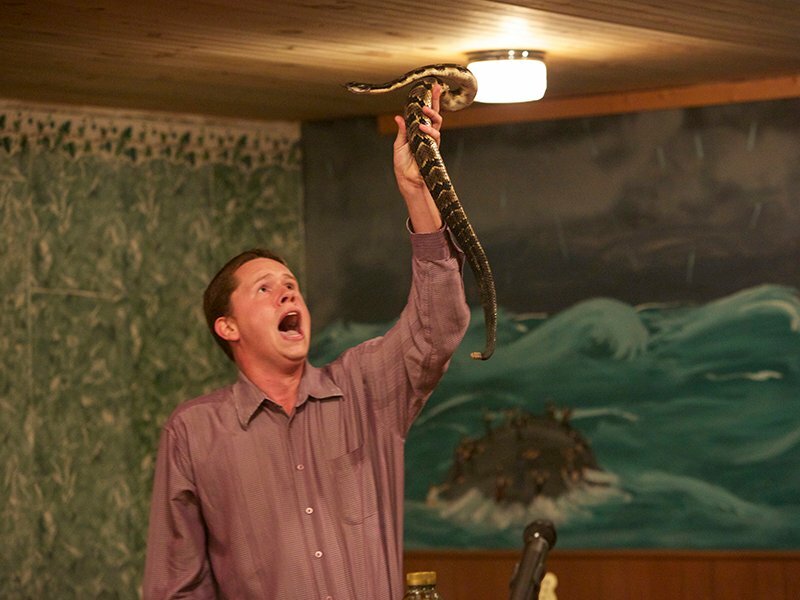 Both Coots and Wolford — like Hamblin in that they wanted to draw more people to the sect — were the subjects of National Geographic’s short-lived reality show “Snake Salvation.” While that 2013 show ushered the curious into some snake-handling churches for the first time, few seem to have stayed. “Elders that carry on the tradition are disturbed by … ‘Snake Salvation’ and marvel at the appeal (to a broader audience) that fails to understand the depth of what it means to handle serpents,” he said in an email. New preachers attracted only by the showmanship of handling snakes are missing the point of the ritual, elders say. Now if we could only get some more good Christians to convert to a “snake-handling” denominations…How about it? …Franklin Graham, Fallwell Jr. Roberson, Perkins, Barton, Dobson, Cruz, Palin, Paula White, others?…Show us true faith…kiss yourself a serpent !! Tempting as it is, I’m going to resist the impulse to crack wise about these people. I mean, I don’t mind taking a swing at a fat pitch now and then, but this is just too easy. But I will say that tempting fate doesn’t seem to me to be the same as faith. If God wants to put me in situations where I may be called upon to become a martyr, so be it. But until that happens, I intend to wear my seat belt, drive at a reasonable speed, watch my cholesterol and avoid poisonous snakes. The great unwashed will always be taken-in by show-biz-wannabee hucksters. Always was – always will be. Bear in mind just 2 EUREKAS, yeah? EUREKA 1: Mark 16:17-18, Luke 10:19 and Acts 28:1-6 – READ IT – weren’t written so you can form a snake-handling religion and congregation! EUREKA 2: Noone else but only George Went Hensley (1880–1955) came up with the idea! This article makes me curious – scripturally curious as to the God-honest truth regarding them snakes and whatever (contrary to these rogue Pentecostals). (1) For some reason, because “the Eleven … [showed] lack of faith … [even] after He had risen”, Christ Jesus rebuked them this way: “Those who believe … will drive out demons … speak in new tongues … pick up snakes with their hands … drink deadly poison [and] not hurt … place their hands on sick people [to] get well” (Mark 16:14-18). That means He knew the forthcoming history of Christianity will be nothing but a history of faithless, borderline atheistic, Christians, like those 11 apostles! “Show … true faith … Kiss … a serpent”? But they did. And still do. All the time, in fact. The serpent’s name is Donald John Trump. One wonders how many Christians, Pentecostals or otherwise, understand that snake handling represents joining two energy flows and moving that new energy up through the fourteen energy centers to attain God Consciousness. This is the reality of the level of compartmentalization believers feel they need to indulge in. They are so desperate to appease their god that they are willing to deny reality. And yet at the same time, I have no doubt but that they look both ways before crossing the street. And wear a seat belt. And don’t stick their hands inside a running lawnmower, etc. They say their god will protect them, but, will he really? What would they do if their god said doing so was a sin? Jesus already told them that washing their hands before eating wasn’t necessary, which is foolish on its face. Give irrationality an inch, and it’ll take a light-year. The last twelve verses, 16:9–20, are not present in two 4th-century manuscripts: Codex Sinaiticus and Codex Vaticanus, the earliest complete manuscripts of Mark. Their faith is based on a later addition to the text and is a grave error. I agree with your overall point that it’s foolish for people to tempt fate in the name of faith. God isn’t in the business of saving people from dumb choices. That said, Jesus didn’t say it wasn’t necessary to wash one’s hands. He just used Jewish rituals concerning the washing of hands to make a point about how true corruption comes from within a person, not from externals. Besides, the Gospels aren’t a manual on personal hygiene. a manual on personal hygiene. Then explain kosher laws. Also, look at what your bible says about menstruation. The laws you referenced were written centuries before the Gospels. Besides, those things dealt mainly with ritual impurity, not personal hygiene, though there is a relationship. So you’re dismissing all of the OT, just because it was written earlier? Well, that’s wrong according to your own Gospels. I’m not dismissing the Old Testament. I just didn’t use it as a point of reference in my original post. And, as I’m not a Biblical literalist, I don’t get caught up in such discussions. In any event, I’m happy for you that you dropped your metaphorical mic. That must have been very satisfying. I’m moving on now. Enjoy your day. I’m not dismissing the Old Testament. And yet, you did just that. I don’t get caught up in such discussions. Congratulations on doing such a masterful job of moving the goalposts. Elaborate, please. What goalpost was moved?